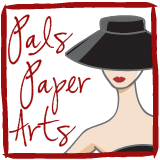 PALS PAPER ARTS announces this week's challenge: Fashion Inspiration "Dress for Success." Use ONE Designer Series Paper, ONE punch and ONE sentiment! 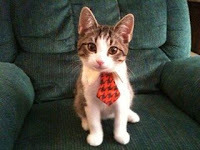 Isn't this kitty a cutie all decked out in his tie? I did NOT know what I would do with the above "restrictions" but here is a clean and simple card to get your ideas flowing. Check out the rest of our Design Team's offerings and then come up with your very own interpretation in this week's challenge. When you play along this week, you will be eligible to win BLOG CANDY! Your entry must be made for this challenge and be directly linked to our site to be eligible. Please use any stamps, paper or accessories to complete your project. It does not have to be Stampin' Up! supplies to be eligible. TIP: I chose to paper-piece the balloon, which I don't believe I have ever done before! All you do is stamp your image onto designer series paper, then cut out a part of it outside the stamped line--in this case the balloon. Then stamp the image again onto card stock and adhere just the cut-out over the second stamping. Voila! Your balloon now has the pattern from the paper on it! Try it, you'll like it! Thanks for visiting today, my friends, and please do leave your comments below. I love reading them and I thank you for letting me know how you like my cards. Patti great CAS card. I like how you did the piercing above the curve and the paper pieced balloon is a perfect match of DSP. Hugs. Patti...this is a wonderful clean and simple card that you stepped up perfectly! The paper piecing and the paper piercing add so much! Great job! Adorable! Love how the balloon is floating up and accented at the top! A perfect combo with the Just Add Cake paper. The paper piercing adds to the dimension too. Love the combination of colors and the balloon as the focal point! The circle behind the balloon is great how it creates dimension! Really cute use of that stamp set. Oh my gosh the picture with the cat and the tie is way to funny. Love the stamp set.